South Carolina Confederate flag: after church shooting flag at Capitol still at full staff. The Confederate flag on the grounds of the State House in Columbia, South Carolina, in 2008. If you’re the governor of a state that suffers a tragedy, the common sign of respect is to fly all the state’s flags at half-staff. It’s what Connecticut Gov. Dannel Malloy did in 2013, after the Sandy Hook Elementary School massacre. It’s what Colorado Gov. John Hickenlooper did in 2012 after the Aurora movie theater shooting. It’s also what South Carolina Gov. Nikki Haley did today, after a white man in Charleston, South Carolina, allegedly shot and killed nine people at a historically black church in an act that is already being investigated by the FBI as a hate crime. Lowering the flag is a widely recognized gesture, a way to honor the dead as the state and country mourn. In South Carolina, however, one flag is a potent symbol of racism—and a symbol claimed by the alleged gunman himself in the form of a decorative plate on his car. So why is the Confederate flag, which flies over the grounds of South Carolina’s Capitol Complex, still waving in the breeze at its peak height? To understand what seems like a shockingly callous move, first you have to understand what the battle flag is doing there at all. (After all, it’s not South Carolina’s state flag, the palmetto flag, which features a rather beautiful tree and crescent design.) The Confederate flag used to fly proudly atop the State House dome itself, ever since the state’s then-all-white legislature voted that it be so in 1962 as a symbol of defiance against the Civil Rights movement. It would take nearly 40 years, a boycott by the NAACP that reportedly cost the state more than $7 billion, massive protests, and the condemnation of presidential nominee John McCain for the Legislature to reconsider flying such a flag on the building that represents their state government. Finally, in 2000, the state passed a bill banning the Confederate flag from being flown over the State House dome as well as in the chambers of the Senate and House of Representatives. It was moved to the south side of the Confederate Soldier Monument, where it stands now. Along with the move came a new statute. “This flag must be flown on a flagpole located at a point on the south side of the Confederate Soldier Monument, centered on the monument, ten feet from the base of the monument at a height of thirty feet,” it reads. 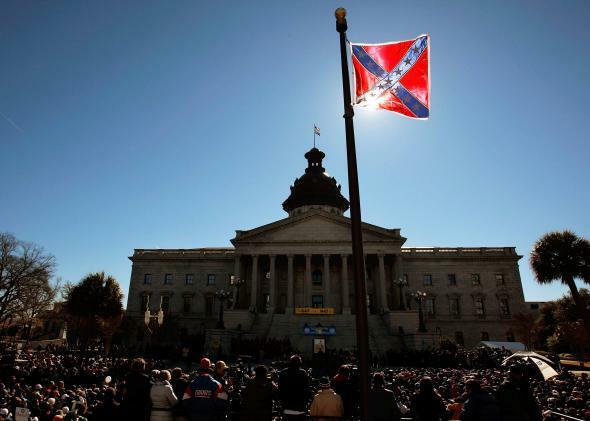 What that means is that in South Carolina, the Confederate flag abides by its own rules. While governors—as well as the president—can usually order that all state and national flags within their jurisdiction be flown at half-staff, this one is exempt. Instead, the Confederate flag’s location can be changed only by a two-thirds vote by both branches of the General Assembly. 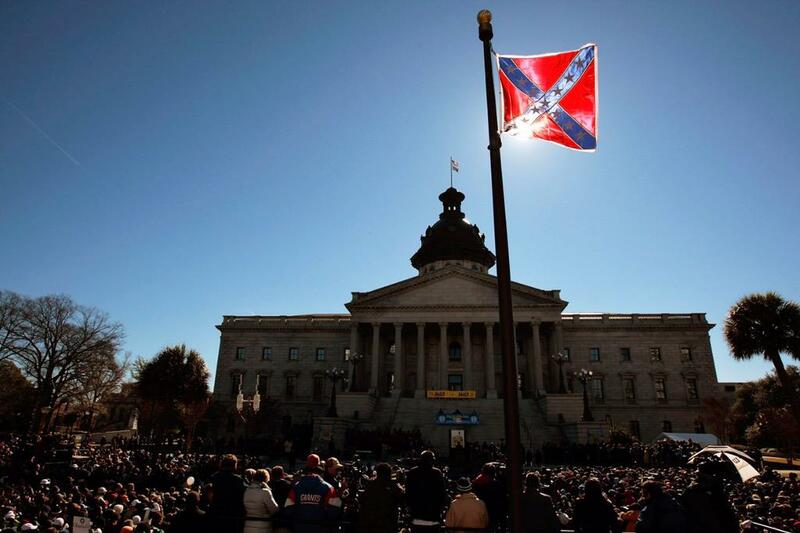 “In South Carolina, the governor does not have legal authority to alter the flag,” said a press secretary for Haley. “Only the General Assembly can do that.” That is why, while other flags under the authority of the state have all been lowered in mourning, this one is still flying so audaciously. Even if Haley could order it lowered, it’s not clear that she would; in the past, she’s actually defended keeping the flag on state grounds, reassuring voters that it’s done nothing to harm the state’s image. Since the General Assembly ended its 2015 legislative session on June 5, it’s likely the Capitol’s Confederate flag will continue to fly high, while the families of the shooter’s nine black victims mourn the carnage of this hate crime. Read more of Slate’s coverage about the Charleston church shooting.